Home Dining Tonight We’re Headed to Steinway Billiards! Tonight We’re Headed to Steinway Billiards! Steinway Billiards is the place to be tonight for the Greece vs. Japan game at 6 p.m! They’ve got not five, not ten, but TWENTY HD Flatscreens, and a HUGE 108″ projection screen. You can literally see the game from anywhere in the entire place (minus the bathroom…but that would be weird). 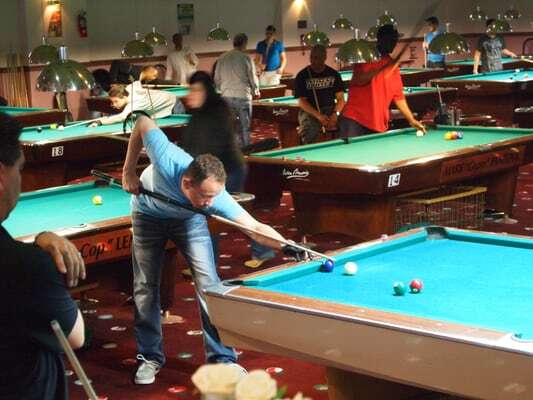 Steinway BIlliards, if you’ve never been there, is a great sized pool hall, as well as cafe. We love going there on a regular night to play a game, but we’re extra excited to head over tonight. It’s super spacey, super comfortable, and most days you can play a game from 11 am to 6pm. The price for two players is just $15 for three hours – which is a complete steal. Have you ever played three hours of pool? It’s more than enough. The food here is delicious. It’s mostly finger food – which is exactly what you want when you’re playing a game, or watching one. We recommend the wings – they’re perfection. If you’re craving something greasy to soak up the match-celebration beers, their mozzarella sticks are always warm, gooey, and perfectly crunchy on the outside. If you’re going with a group – opt for the pitchers, we find that’s usually the best way to satisfy, and try out all the nachos. We’re partial to the Texas style! And don’t forget: FREE T-SHIRTS! Just ask for one !